Music video by Katy Perry performing Part Of Me. (P) (C) 2012 Capitol Records, LLC. All rights reserved. 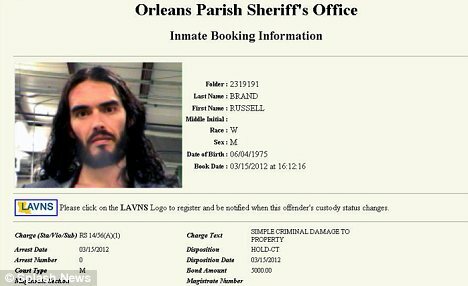 Russell Brand has been arrested, after a warrant was issued for his arrest by New Orleans Police, following an incident on monday. 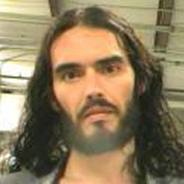 Russell Brand is accused of stealing a mobile phone and throwing it through a window of a nearby office. It is thought that after hearing the warrant had been produced, Brand handed himself in. His mug shot was taken, and he was charged with ‘simple criminal damage to property valued at $700′The warrant was issued after the incident on monday in which photographer Timothy Jackson, claims that Brand snatched his iPhone, after Photographer Jackson took the opportunity to snap pictures of Brand. Brand is said to have then thrown the phone which went through the front window of a nearby law firm office. Russell Brand is in New Orleans filming a movie with co-star Julianne Hough. A few days ago paparazzi got into a little dispute with Hollywood actor and Comedian Russell Brand, but this dispute looks like it may not be so little now. After Russell Brand snatched an iPhone from a photographer for taking photographs of the actor , Brand allegedly threw it and it broke the window of a nearby law firm. Today TMZ.com has claimed that New Orleans police have a misdemeanor warrant for criminal damage to property was issued against Brand following his run in. It is thought Brand was in the middle of filming in Nawlins, on Monday when the incident happened, and it was all caught on camera. This is the momet the incident is said to have happened.according to TMZ.com People connected to Russell Brand, contacted the law firm and said the actor would be willing to pay for the damage to the window. 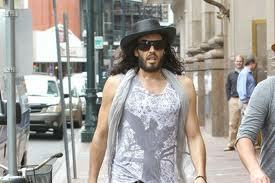 It is thought that the New Orleans Police are now searching for Russel Brand.